Dear Friends… KANO CELEBRATES ITS ILLUSTRIOUS SON, GENERAL MURTALA RAMAT MUHAMMED, WITH A COMMEMORATIVE EVENT, 40 YEARS AFTER. Confabulation, Jonathan’s Angels, absolution, Fayose’s comeback, Ibadan Soka’s slaughter land and other matters arising. Presidential visit, campaigns, Alam’s loot, Sanusi’s unending fiery darts and other matters arising. For the umpteenth time, President Goodluck Jonathan of Nigeria is being harangued by the opposition party, the All Progressives Congress, APC, for not considering it pertinent to visit Yobe State as a show of empathising with the families and other residents of the state in the wake of the gruesome murder of about 29 school children by the ever deadly Boko Haram. Asking the President to take a cue from what obtains in other climes, the APC challenged him to tell Nigerians why he has not or why he would not visit the scene of the gruesome murders. Some observers believe the opposition is just trying to portray the much beloved and intrepid President as a lily-livered or insensitive chief of state. We, however, believe this is not the case. The opposition party had also accused the President and his party, the Peoples Democratic Party, PDP, of embarking on premature electioneering campaigns. Of course, as expected, Jonathan and his party mavericks as well as army of supporters would not be fazed by these spate of accusations. In any case, the ever impartial electoral umpire, the Independent National Commission (INEC), had promptly lent its voice to the fray by stating that all the political parties are guilty of this malfeasance. Well, we expect that more than just a presidential visit, the President will be taking his party political campaign trail to the hot spots of the insurgencies in the North-Eastern part of the country to receive Boko Haram defectors whom we know are eager to come under the wide umbrella of the PDP, wide enough to shield all kinds of characters, especially the disaffected ‘decampees’ from the other parties – including, as some detractors have mischievously pointed out, ex-convicts, those who are under the EFCC rader, international fugitives, among others. Some observers are even of the strong belief that the delegates’ list to the imminent National Conference is incomplete without Boko Haram members. We expect that the delegates will be led by the leader of the group, Shekau. 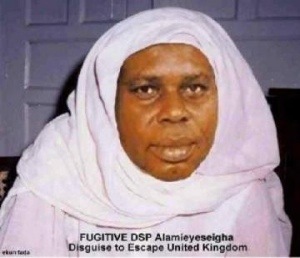 The one time Bayelsa State Governor, the feisty Diepreye Alamieyeseigha who went down the road of transvestism to evade the long arm of the law when he was being trailed for massively looting the treasures of the state, is alarmingly in the news lately. Alam, if you recall, graciously received unprecedented presidential pardon from his protege, President Jonathan. His loot is currently the bone of contention. A private citizen who is a lawyer, purportedly acting on behalf of the state government, instituted a court action to compel the anti-graft agency, EFCC, to remit the forfeited loot to the state’s coffers. The state government had since disowned the lawyer and his court action. Some mischief makers are, however, suspicious of the positions and reactions of the major players in the unfolding saga, especially the government and the anti-graft agency. Well, we just want to remind the nosy Parkers that they are just raising false alarm. Whatever has happened, we want them to note that the value of the loot is less compared to one goat stolen by a common criminal or the twenty Naira pilfered by a pickpocket. As usual, everything will be swept under the carpet. 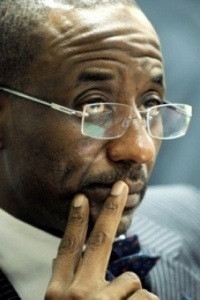 The suspended Central Bank boss, Sanusi Lamido Sanusi, is remorselessly shooting the breeze. He is still straining to make us believe that 20 billion dollars of the country’s fuel money went missing. He is relentlessly trying to demonise the petroleum behemoth, NNPC, as working with a cabal to generate slush funds for the ruling party to execute the forthcoming elections. He reportedly told the New York Times in an interview, of his behind the scene jousting with some gnomes of the Nigerian banking world to expose the missing fuel money. Alarmed by his threat to the bankers to open their books, two of them went straight to the government and reported him to a preeminent cabinet member. As a result, he knew there and then that his days were numbered at the CBN. Sanusi’s claims, as expected, had since been debunked by the government’s spokespersons.